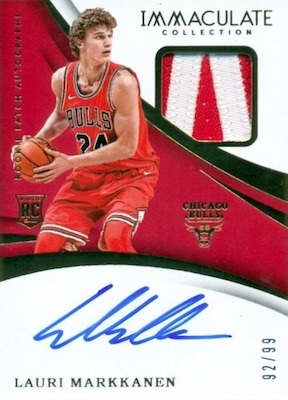 Saving some of the most popular NBA cards for the very end of the '17-18 collecting season, 2017-18 Panini Immaculate Collection Basketball is a perfect example of sticking with what works. The premium set barely changes the design or format but still supplies some of the most impressive options of the year, especially for rookies. Boxes contain five autographs or memorabilia cards. At one card per box, the base set is an annual occurrence but largely overlooked due to the many other high-end choices. These are numbered to 75 and come with even more limited parallels. However, for the breakers, and the collectors who can stomach the box costs, the hits are all that really matters in the 2017-18 Panini Immaculate Collection Basketball checklist. All displaying a signature and swatch piece, the Patch Autographs, Rookie Patch Autographs and Premium Patch Autographs cards take center stage (or is it center court?). The RPA and Patch Autograph sets have Jersey Number parallels, as well. For the ultimate chase, there are the famed Logoman Autographs and Rookie Logoman Autographs. And did we mention the Dual Rookie Logoman Autographs? Other autographed inserts include multi-signed Dual, Triple and Quad cards. 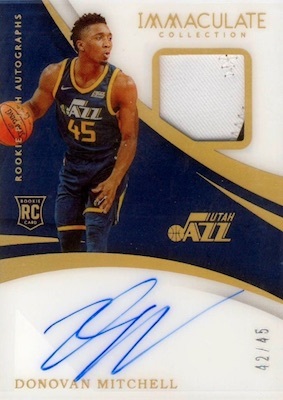 Relic cards can start to feel like filler, even in the expensive sets, but 2017-18 Panini Immaculate Collection Basketball does present a quality selection. The Jumbo Patches line again features Jersey Number, Nameplate and Team Logo editions, while collectors can also find the all-new Brand Logo and Team Slogans cards with oversized memorabilia pieces. For the sneakerheads, Sneak Peek focuses on specific parts of the shoe, including brand logos, heel logos, tongue logos and shoelaces. MARKELLE FULTZ 2017 18 IMMACULATE COLLECTION #6 25 RC MILESTONES ACETATE AUTO!! 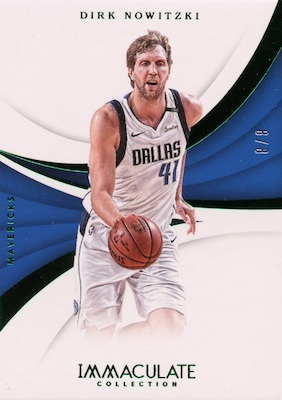 Shop 2017-18 Immaculate NBA cards on eBay. PARALLEL CARDS: Red #/35, Blue #/25, Gold #/10, Emerald #/8 (FOTL), Platinum 1/1. PARALLEL CARDS: Red #/25, Gold #/10, Tags #/3, Logoman 1/1 (No Josh Hart*). PARALLEL CARDS: Red #/25, Gold #/10, Platinum 1/1. PARALLEL CARDS: Red #/15 or #/10, Gold #/10 or #/5, Tags 1/1. JUMBO PARALLELS: Jumbo #/10 or #/5, Platinum 1/1. 40 base and 33 Jumbo cards. 30 base and 16 Jumbo cards. 52 cards. First Off the Line (FOTL) only. PARALLEL CARDS: Red #/25 or less, Gold #/10 or #/5, Platinum 1/1. 259 cards. Serial numbered 1/1. PARALLEL CARDS: Red #/25 or less, Gold #/10 or less, Platinum 1/1. PARALLEL CARDS: Red #/25 (No Irving*), Gold #/10 (No Irving*), Platinum 1/1. View the 2017-18 Panini Immaculate Basketball checklist spreadsheet. Was just in on a FOTL break of this and it was baaaaaad. IN two boxes there were maybe 2 cards that would resell for over $50. I really hope other cases are better than this. Thanks for the headsup Peter…makes no sense to release oppulance, then imacculate then flawless all within about 30 days. Ill save my money for the flawless release october 31st. I figure you lose all your money on these high end products unless you hit a prime patch rookie auto or logoman but ill buy flawless anyways. I have been seriously unimpressed with the mix of cards in the boxes. I have purchased two boxes, and participated in 5 “case breaks”. The first box had literally nobody I can remember…well, Shaun Livingston which I remember because there was two Livingston cards in the box. The sell value on eBay for the card total was about $70. The second box actually had a nice Mitchell auto (going about $200 on eBay so not too bad), but it was surfaced scuffed significantly and won’t grade well. One of the case breaks had a Mitchell too, but the rest were completely unremarkable. Disappointed with the box collation and condition of the cards. I mean, no $500 box of cards with 6 cards in it should have two of the same crappy player like that. Honestly, if you are chasing one of the big rookies, just save your money and buy the card you want on eBay.